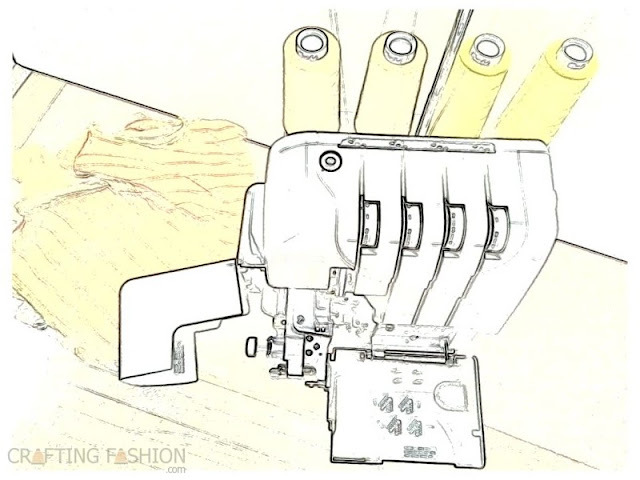 In the garment industry, the machine with needles and loopers that sews, trims, and finishes the fabric edge with thread all at once is known as a Merrow machine or overlocker. In the carpet industry, the machine that finishes a carpet edge with threads, needle, and looper is called a serger. Home sewists, based in the US as I'm sure you know, use that term as well. Industrial or domestic, it's an interesting and useful tool. Where does the name “Merrow machine” come from? It's named after its inventor. 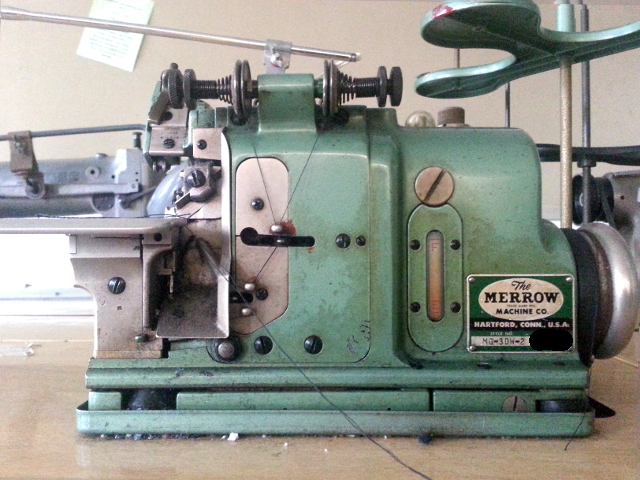 According to the Merrow Sewing Machine Company, the first Merrow Crochet Machine was invented in 1868 by Joseph Millard Merrow to finish the top edges of men’s socks knitted at Merrow Mills in Hartford, Connecticut. After a century and a half of developing various sewing machine technologies, the company is now run by the great-grandnephews of the founder. The history is fascinating, and you can read about it here. 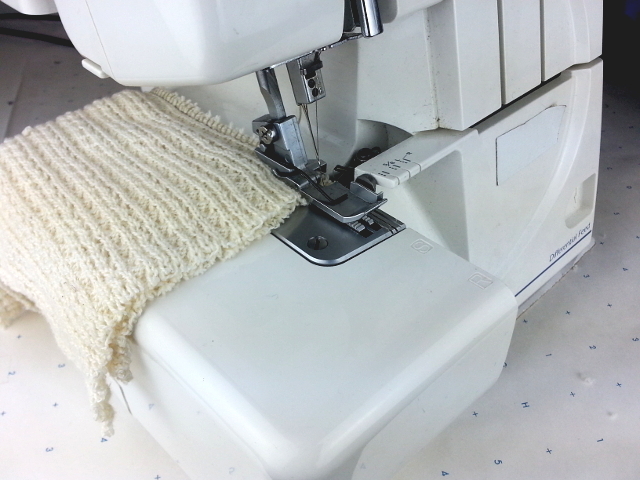 A serger isn’t mandatory for cutting and sewing sweater knit fabrics; there are other methods. Overlocking, however, is very efficient. It trims an edge then immediately stitches the fabric and finishes it with thread looped around the trimmed edge. Three tasks are completed with a single pass through the machine. Some say it’s not the prettiest edge on sweater knits, and they prefer a bound or covered finish on their seam allowances. I use whatever seems to work for the situation. I usually finish the insides of cardigans (where one might see the seams of an opened cardi) with bound or covered seam allowances. (#slowsewing... You won’t see this premium finish on commercially produced ready-to-wear cut and sew sweaters!) Pullovers are usually finished with a neatly overlocked edge. My Roadmap for Improved Sweater Knit Seams guides you with most of the important tips for getting smooth seams when sewing sweater knits. 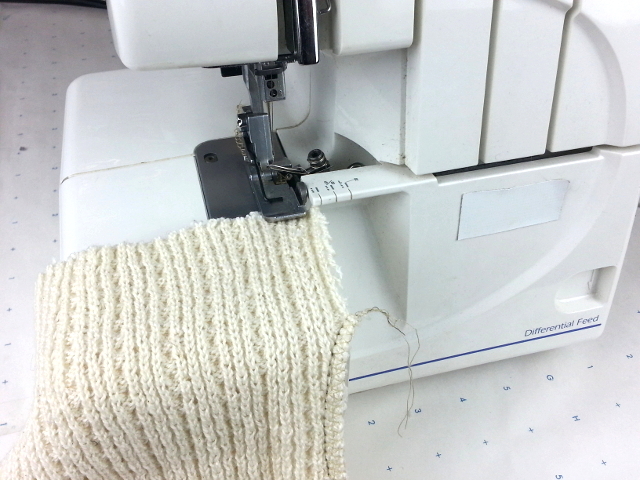 A student in my How to Cut and Sew a Sweater course, however, encountered another issue that can sometimes come up. She was overlocking the edges of her fabric in preparation for washing it. While she was somewhat pleased because she had finally achieved a neat, non-rippling edge, the last inch or so continued to stretch out of shape. Now this is not a big deal when prepping fabric, but it’s of concern when it happens at the bottom of a side seam, for example! When this type of stretching occurs only at the end of a seam, you know your differential feed settings are probably correct. The major part of the overlocked seam looks good and there's no reason to further reduce the pressure of the presser foot. The trailing stretch happens when the front part of the presser foot is no longer supported by the fabric as you reach the end of the seam. (See pic below.) The front of the presser foot at this point sits directly on the feed dogs, and the back of the foot sometimes grabs onto that last inch of fabric, stretching it out of shape. 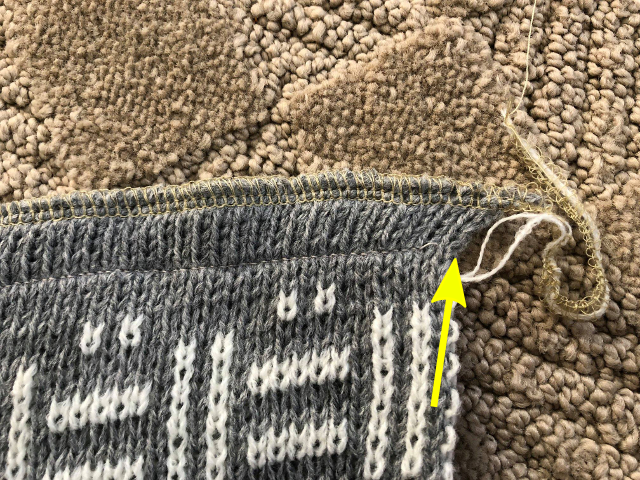 Because sweater knits usually have a greater crosswise stretch, this situation can appear worse when stitching crosswise, as in my student's example above. I'll be demonstrating with a lengthwise seam, because this problem can be more noticeable at the bottom of a side seam. The last inch where the front of the presser foot sits directly on the feed dog. So how do you fix that last bit? Simple! To get rid of the pulled fabric at the end of the seam, (1) serge up to the last 3 inches or so and serge off to the side of the fabric. Then (2) flip the fabric over and start the seam from the other end. Overlap the stitches and serge off the side edge of the fabric again. It’s just that easy and keeps that unsightly stretch from happening. 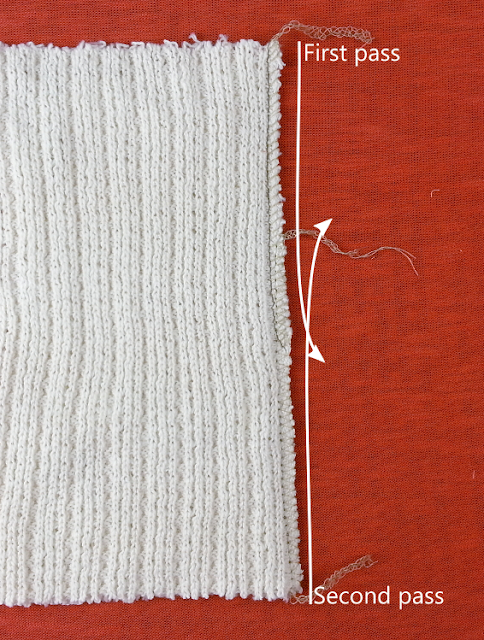 For more tips and techniques on cutting and sewing sweater knits, be sure to join the list. Info on O! Jolly! sweater knit fabric sales, too!